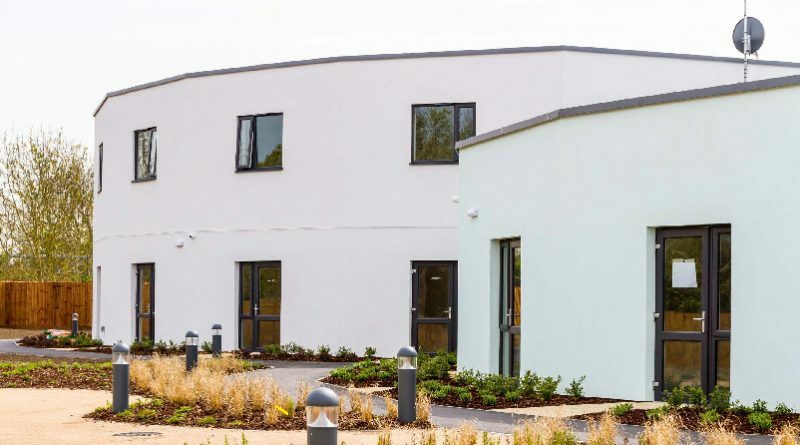 The high performance weber.rend MT multi-coat render system by Saint-Gobain Weber has been applied as the exterior finish on the new-build Woodward Close, a pioneering 60-bed dementia care home in Winnersh, Berkshire. The project was developed by specialist care home developer Castleoak, Cardiff, for national care operator The Abbeyfield Society. Designed to meet Abbeyfield’s innovative dementia design strategy, this new care home comprises intimate circular bedroom wings which minimise corridors and lead to communal spaces to aid way finding and spatial recognition. Ground floor rooms have patio door access to garden space and internal links to safe and secure inner courtyard gardens. It has been carefully planned to provide a unique approach in residential care for those living in the local area in a manner which hasn’t been seen before. The complex clover leaf layout of the five linked buildings has been achieved using timber frame construction with much of the fabrication carried out off-site including the curved outer skin formed by the render carrier board for the weber.rend MT system. This off-site construction method reduced time and cost early in the build program, overcoming the requirement of bricklayers and bricks, resulting in a cleaner and tidier site and substantially reducing the on-site program. The weber.rend MT multi-coat render system by Weber, the leading UK formulator and manufacturer of innovative materials, systems and solutions for the construction industry, has full BBA Certification. This accreditation meets NHBC requirements for new build housing where house builders and developers are constantly seeking modern methods of construction for speed and cost efficiency. The weber.rend MT system is designed to rapidly finish buildings of frame and panel construction. weber.rend MT is a light-weight render system which incorporates glass-fibre meshcloth reinforcement with a resin-rich adhesive coat that can carry a choice of finishes in a wide range of colours. This modern render system is designed for large areas of stable render carrier boards without the need for expressed joints to create smooth, modern design aesthetics. Equally, weber.rend MT is ideal for application to uneven masonry or mixed substrates where a high level of crack resistance is required. Application on to a panel background requires an initial 3mm of weber.rend LAC. The glass fibre reinforcing mesh is laid in as this coat takes up and a second 3mm of weber.rend LAC is applied. Sponge finish achieves a flat surface. When fully dry, weber PR310 primer is applied prior to the selected finish. A variety of textured and coloured finishes can be used to produce weatherproof, vapour permeable protection. Castleoak’s project construction manager Dean Hamblin reports positive comments on the render finish of the buildings. “People are remarking how sharp the buildings look, that’s sharp in colours and sharp in straight surfaces and edges,” advises Mr Hamblin. Woodward Close offers a wide range of highly innovative communal facilities, including a cinema, activity rooms for painting and sewing, a restaurant and a cafe, sensory rooms and wellbeing areas including spa bathrooms, a hair and nail salon, a library, and a shop stocked with groceries. In terms of design, memorabilia and reminiscence will be a strong focus across the development. There will be classic cars and bikes in the grounds and a vintage theme prominent throughout the interior decor. It is hoped that this vision and the calibre of the building will act as a blueprint for future Abbeyfield care homes.